Video Converter for Windows can easily convert video files in all popular formats for playback on iPad, iPod, iPhone, Android, PSP, Zune, BlackBerry, and a lot more mobile devices. It also lets you download and convert YouTube videos. Platform: Windows 10 / 8 / 7 / Vista / XP. Video Converter for Mac lets you convert video files to a variety of formats, including MP4, AVI, FLV, MOV, 3GP, HTML5 Web Video, extract audio from video files, and download video from YouTube. Platform: Intel-based Mac (32bit or 64bit), Mac OS X 10.5 or above. Apr 15, 2013, Video Converter for Windows v2.8.2 released! 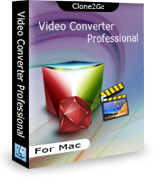 Apr 13, 2013, Video Converter for Mac v3.6.1 released! Apr 13, 2013, YouTube Downloader for Mac v2.3.1 released! 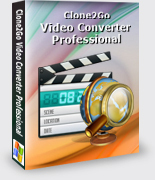 Mar 21, 2010, Clone2Go Video Converter Professional featured on Giveaway of the Day. The boxes under profile are editable, giving the user excellent control of the output file. this makes it much more useful than many converters. It is not restricted to output to iPods, etc. but deals very well with other outputs. What sets Clone2Go apart from some other video converters out there is that it makes batch video conversion a snap. Just add as many files to the queue as you like and click the start button to begin an encoding job. You can even configure Clone2Go to shutdown your computer when it's done. Another nice feature is Clone2Go's integrated web video downloader. You can grab videos from YouTube or Google Video just by entering a URL. There's also a built in video player, which lets you watch videos you've downloaded or converted.